Rowan, age 5, 41 lbs, on "The Bouncy Thing." TBT uses giant industrial strength rubber bands and air mats to let you spring up into the air. 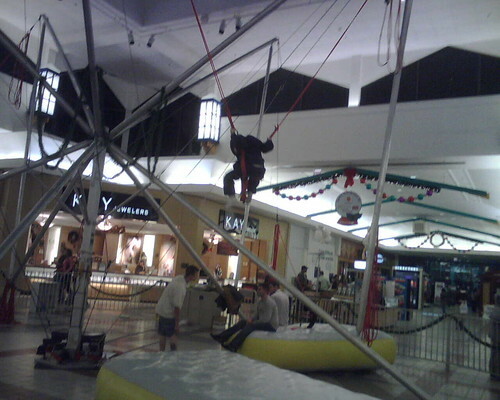 The jumper is attached to the rubber bands witha climbing harness which is attached to a cable. This cable pulls them up high enough so that the rubber bands can be adjusted to just support their weight with the tips of their toes on the air mat. It’s at the Liberty Tree Mall in Danvers (Rte 128, Endicott St. exit). Rowan was a very good advertisement for this, because he kept shouting, "This is the most fun thing I’ve ever done in my life!" I almost expected a refund of the it costs to take a ride. The ride lasts a pretty long time, which is nice. You need to be between 30 and 230 lbs and in good health to take a ride, and sign a "Don’t Sue Us!" waiver.